An interesting study published in The New England Journal of Medicine finds that coffee drinking among the study’s participants was associated with lower risks of mortality. The study does, however, not reveal whether the suggested relationship is a casual one or simply a correlation. If coffee drinking would have an inverse impact on mortality, it is possible that it affects the brain in a positive way. But it is also plausible that healthy persons for some reason have higher coffee-intakes. Or that coffee drinking correlates with exercising, thus having an indirect effect on mortality. 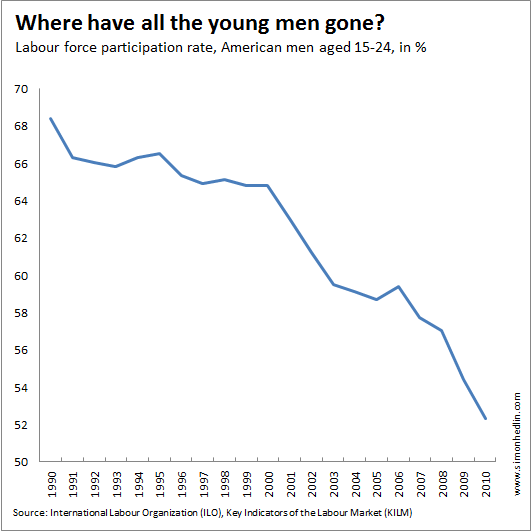 In addition to a slow-growing labour force with a falling labour force participation rate, there is another growing problem: a relatively smaller potential workforce. Alongside the other many problems it faces, China too has its deadly point of unseen weakness: demography. /…/ Between 2010 and 2050 China’s workforce will shrink as a share of the population by 11 percentage points, from 72% to 61%—a huge contraction, even allowing for the fact that the workforce share is exceptionally large now. That means China’s old-age dependency ratio (which compares the number of people over 65 with those aged 15 to 64) will soar. At the moment the ratio is 11—roughly half America’s level of 20. But by 2050, China’s old-age ratio will have risen fourfold to 42, surpassing America’s. True, China’s demographic prospects from an economic viewpoint do indeed look glum. Considering several important factors such as population growth, median age and old-age dependency rate, America’s position does in comparison look better. But it is important to note the “in comparison”, because as stated, America has its own demographic issues. 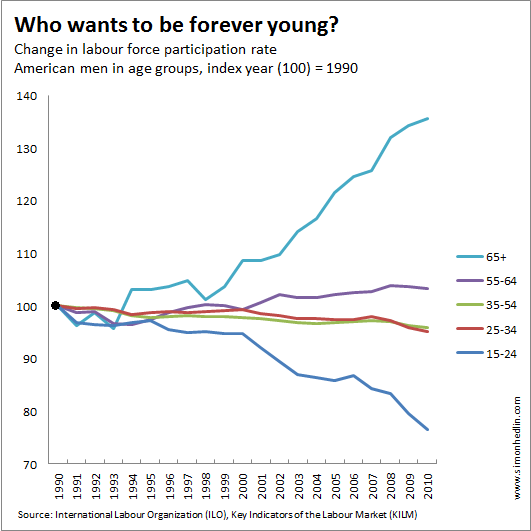 And aside from the fact that the labour force participation rate is falling, the number of persons in working-age (aged 15-64) in relation to the number of children and seniors is rapidly contracting, as this graph shows. 1) implies slower economic growth, 2) means fewer workers are active on the labour market relative to the number of people who are likely to need support, and 3) will likely make the effects of 2) worse. Hypothetically, with a faster growing labour force and a constant labour force participation rate, 3) alone would still constitute a worrying development. Thus, if these three issues are not taken seriously, America might really be heading for trouble. Most people who have taken a Principles of Economics 101 course are familiar with the convergence hypothesis, i.e. 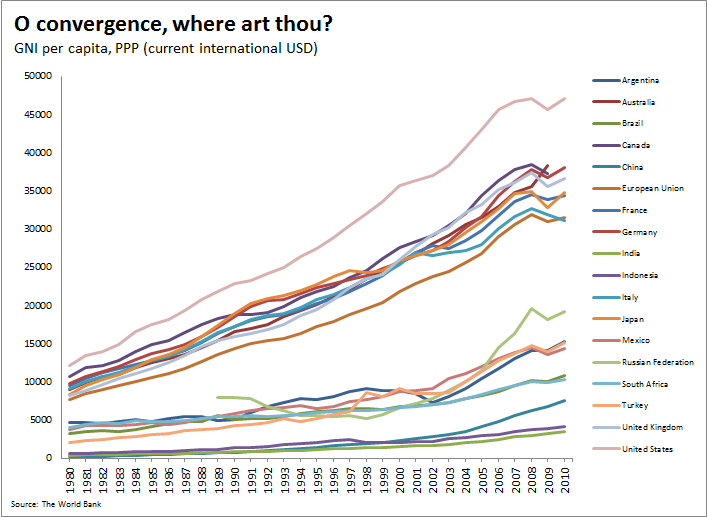 that poorer economies in terms of per capita should grow at faster rates than wealthier economies eventually resulting in a convergence. 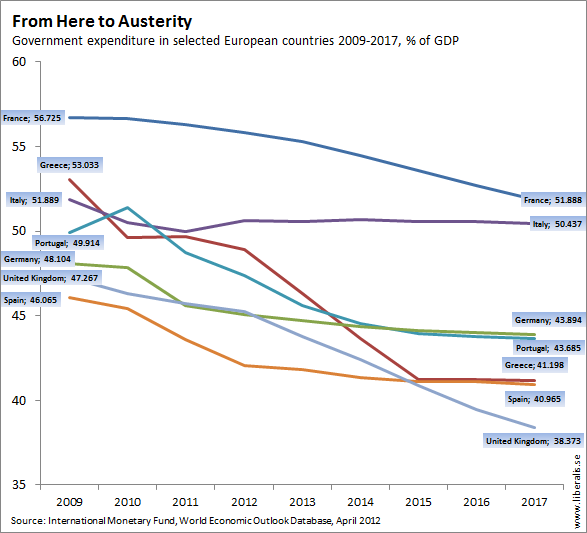 Few would probably defend the absolute version of the convergence hypothesis today, but if there is somebody who does, the following graph will at least show that we are not quite there yet.